June 26: Often compared to Michael Phelps due to her versatility in the pool, Franklin makes her first appearance in the pool. 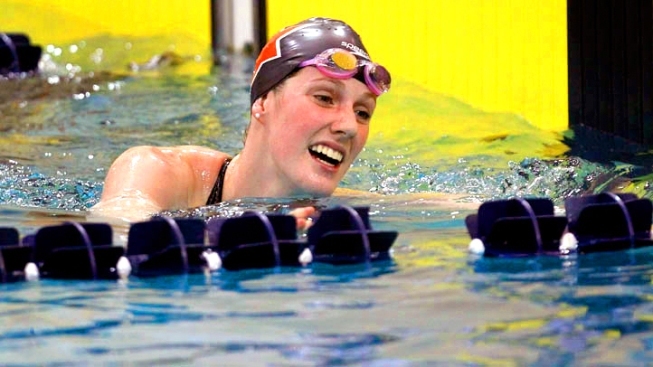 17-year-old Melissa "Missy" Franklin is entered in five events at the Olympic trials. The event: Swimming: women's 100m breast, 100m back (semifinals); women's 100m fly, 400m free (finals); men's 200m free, 100m back (semifinals) and men's 100m breast (final). When: 6.30 p.m. to 8 p.m. ET June 26, NBC Sports Network and 8 p.m. to 9 p.m. ET June 26, NBC. Where: CenturyLink Center in Omaha, Neb. Ones to watch: 17-year-old Melissa "Missy" Franklin from Colorado is often compared to Michael Phelps due to her versatility in the pool. Franklin is entered in five events at the Olympic trials and today will see her competing in the 100m backstroke. She will face stiff competition in the race from 11-time Olympic medalist Natalie Coughlin, 29, who is top seeded with a time of 59.12 seconds. Franklin is seeded second with a time of 59.18. Franklin and her parents have remained adamant that she will go on to swim at college following her senior year at Regis Jesuit High in suburban Denver, which begins in the fall. Her parents have refused offers from agents who suggested the teen forgo college and earn big endorsement money now. "For my parents to let me turn down the money that I have been offered to go pro, it's unbelievable," Franklin told Fox Sports. "They want me to enjoy my senior year in high school. I am so excited to be a senior, finally. It doesn't get more fun than that." Except perhaps being a Olympic medal-winning high school senior. While swimmers schedule their races in advance, they are free to scratch any and all events from their program. Announcements are made prior to the race concerning participants. What happens: The two swimmers with the fastest times in the individual event finals will earn a spot on the team bound for London. Read more about the Olympic swimming trials and events. For broadcast information, visit NBC 's Olympic website and click on "TV Listings" for your local listings.